« 100th Post Give Away! Hi all! It’s been so quiet around here… must be all that spring cleaning (or fall bundling-up-edness for you southern-hemisphere folks ;))… I haven’t been slacking, I swear… I have been embroiled in battle! 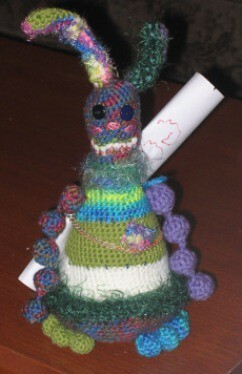 Over on Ravelry, I got drafted into Killer Bunnies, a battle royale (http://www.ravelry.com/groups/killer-rabbit) and I’m on my second victim! I actually got a bruise on my pinky. It’s viscious! The pattern, Frankebunny, is supposed to be a mishmosh of different stuff, and it’s cute if kind of strange… they did a knitted version too in the spirit of Monty Python, but I fear DPNs. Anyway just sharing what I’ve been up to… what have YOU been doing?